Home > Snow Bros Jr > Retro reflections: Snow Bros. Oh how I love Snow Bros.
Retro reflections: Snow Bros. Oh how I love Snow Bros.
One of my favourite games as a kid was Snow Bros. Jr. on the Game Boy Color. It wasn't even my game. It belonged to my cousins, but every time I would visit I would end up borrowing the game for as long as I possibly could. They weren't such big fans of games though, and didn't really look after their copy of precious, precious Snow Bros. Jr. One time I visited and discovered that they could no longer find the game. Because this game had been ridiculously hard to find, I never had the opportunity to have a copy of the game for myself, so that was it, really. I was pretty sad about this all. It would be something like 25 years before I'd ever get to play the game again, too. But then last year I found a copy for sale at Super Potato in Japan. I'm never letting this little fellow out of my sight again. One thing I had never done, though, is play the actual Snow Bros. game. That was until last weekend, when my arcade cocktail cabinet showed up, and on that there were not one, but three versions of Snow Bros.; The NES, Mega Drive, and Arcade games. So you can imagine how happy I've been with this. For those who haven't played Snow Bros. before, it's fairly similar to Bubble Bobble (not to be confused with Puzzle Bobble). It's a single screen arcade game, in which you need to clear it of enemies, collecting as many points as possible, before moving on to the next stage (which would be designed differently and have different enemies to take on). As with all arcade games of that age, it's a fairly simple game, but the challenge is both high and addictive; you'll know when you lose a life that it was simply your lack of skill to blame, and you'll always feel like you can push on a bit further with your next attempt. 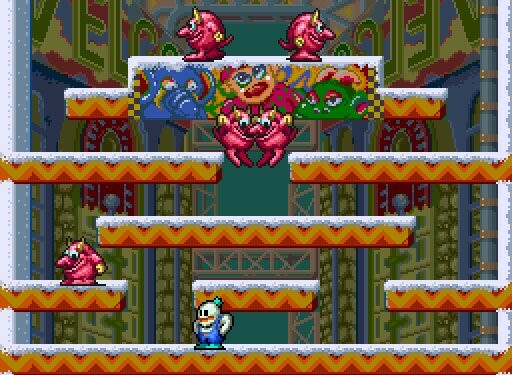 The difference between Bubble Bobble and Snow Bros. was the weapon that you used to clear away enemies. In Bubble Bobble, your little dinosaur character would spit a bubble at the enemy, which would catch him. By then jumping on the bubble you'd "pop" it and defeat the enemy in the process. In Snow Bros., you're in command of an animated snowman, and your task is to instead shoot snowballs until the enemy is completely encased. From there you can roll the giant snowball from wherever you trapped the enemy down the stage, taking out any other enemies on the way down. As simple as this sounds, it was a major, major addition to the core "Bubble Bobble formula." It added some challenge (if you wanted to clear the screen with a single rolled enemy, you'd need to get to the top of the stage, and navigating past the other enemies could be an incredible challenge). It also added some additional skill; being able to time the roll of the snowball so that it would collect as many other enemies on the way down as possible. Snow Bros. was the more complex game, and getting a really big score in the game felt like such an achievement as a result. 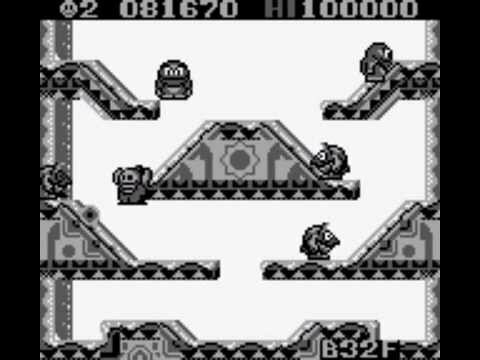 Having only ever squinted at the game in a little tiny monochrome Game Boy previously, I'm really amazed by how good Snow Bros. looks, too. The sprites are big and animated with a lot of personality (even on the NES version, which is a substantial visual downgrade). The music is retained across all the game's versions, and that makes me really happy too, because that Snow Bros. theme is just so incredibly catchy. Snow Bros. Jr. even had boss battles! I don't remember the specifics of them (relearning old skills is taking me time), but I do remember as a kid getting through two of them, which was a pretty incredible feat, given that I can't even get up to the first one now. They happened every ten levels, and I do remember looking forward to them, as they were well designed and required a different strategy to the normal levels (and thus provided the game with good variety). I don't know if there are boss battles in the arcade game, though I assume so, as Snow Bros. Jr. has been a faithful port of Snow Bros. in every other way. At the moment I can get to the ninth stage in Snow Bros... so I'm nearly there. Honestly, having these games on my arcade cabinet alone dispelled any lingering doubts I had about making such a significant purchase. Not that I think a couple of thousand dollars is the right price for a couple of versions of a single game, but there's so many more games on the machine, of course, and so many classics. And knowing that I'll be able to go back to such nostalgic classics as that is, really, the perfect purchase.